The Department of Design is hosting a symposium on Comics and Censorship by Lena Merhej, Irina Chiaburu, Charles Brownstein, and Rana Saghieh. Lena Merhej (Ph.D.) studied Design and Technology at the Parsons School of Design (MFA). Her research, “Analysis of Graphic Narratives: War in Lebanese Comics”, at Jacobs University in Bremen, granted her a doctorate degree in Visual Studies in 2015. Her animations received international awards as well as the comics magazine Samandal that she co-founded. Charles Brownstein is a profile and sought out lecturer on the history of comics and censorship who has addressed audiences across the United States, as well as in Japan, Canada, Norway, and the United Kingdom. He currently serves as the chair of the Banned Books Week Coalition. Irina Chiaburu holds an M.A. and a Ph.D. from Jacobs University. Her research on the “Subversion in Soviet animation during the Brezhnev era” addresses the conflict between the creative Soviet intelligentsia and Brezhnev’s censorship apparatus. Rana Saghieh has a master’s degree in Political Science from the “Institut d’Etudes Politiques” in France. Since 2005, she worked on legal proceedings, corporations’ law, and strategic social consultancies that include the “Artistic Freedom in Lebanon: Update on Censorship in Lebanon” (2015). 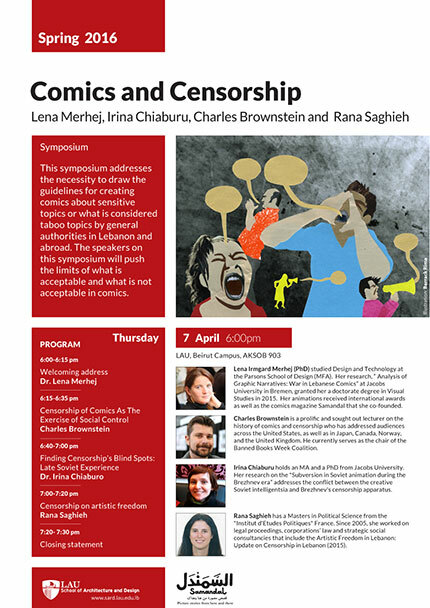 The symposium addresses the necessity to draw the guidelines for creating comics about sensitive topics or what is considered taboo topics by general authorities in Lebanon and abroad. The speakers on this symposium will discuss the extent with which one can push the limits of what is acceptable and what is not acceptable in comics. Click here for more information on the program of the symposium.